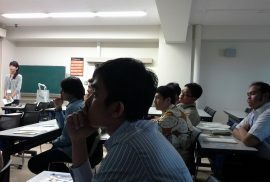 Our first day of the TWINCLE program in Chiba University was started quite late since we have landed in Japan in the middle of the night on the previous day. After spending some times of sightseeing on the neighborhood in the Chiba international dormitory, we have been guided to go to Chiba University for the first time of our life by Oshima Sensei, one of the supervisors for our program. 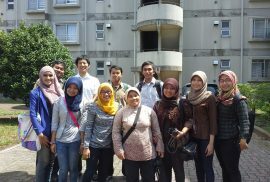 -is a joint program between Chiba University, Japan and several universities in Indonesia. Universitas Gadjah Mada (UGM) is one of the partner universities in Indonesia besides Universitas Indonesia, Universitas Udayana, and other universities.